To earn an overtime bonus of 19 euros, or $27, two volunteer French firefighters have admitted to starting forest fires on the island of Corsica, according to news reports. While it's not as dumb as having your boss killed so you won't get laid off, it has to be up there on the list of dumb things to do at work. Job security is important, but I doubt if police officers are committing crimes so that other officers have work to do. The 19 euro bonus was an overtime bonus for working at night on July 8. The bigger bonus of 38 euros, or $57, was double overtime pay for working on a holiday, July 14 -- Bastille Day, France's top holiday. The men, ages 22 and 25, admitted to starting the fires on those days north of Ajaccio in Corsica so they could earn the bonus payments by fighting the blazes. One fire was serious enough to require a Canadair plane to fight it. The two men face 15 years to life in prison if convicted of arson. One of the men was unemployed and the other had a temporary job. Arson, they're discovering, doesn't pay. 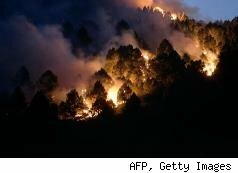 To earn an overtime bonus of 19 euros, or $27, two volunteer French firefighters have admitted to starting forest fires on the island of Corsica. Watch out for your property! Browse through our gallery to find out how.